Sandals Negril Resort main pool is oceanfront and the most active pool at the resort. In addition to hosting the resort's swim-up bar, the pool features a volleyball net and lively music throughout the day. The main pool is located near the main lobby & front desk is situated next to the Bayside Restaurant. This pool features a whirlpool and is where the swim-up bar is located. Direct shot of the swim-up bar at the main pool. 2013 renovation completed of the main pool deck swim-up bar area. Photo of the main pool and swim-up bar at night. Swim-up bar and a group playing volleyball. All flights go through the Montego Bay airport (MBJ). Negril is popular beach strip destination, and world-class beach. 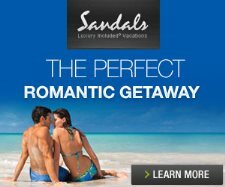 Sandals Negril is located 75 minutes from the airport.